After almost five years, I finally bought a new cellphone/smartphone. Although I also have an extra Samsung cellphone given by my husband, when it comes to durability I still prefer my old cellphone Sony Ericsson. I have been using Sony Ericsson K610i since 2006 and it never let me down until now. My Sony Ericsson K610i is the smallest 3G phone in the year 2006. Although my old cellphone is still 100% functional, I decided to buy a new one because I need a cellphone with extra features that would be a great help for a super work-at-home mom like me. Smartphone technologies are really in demand in the new generation. The features that I am looking for in consideringÂ smartphone are the connectivity features like wifi internet ready, Bluetooth, 3G, Mail features that I can sync my email from personal computer, updates stream for news and many other important features. 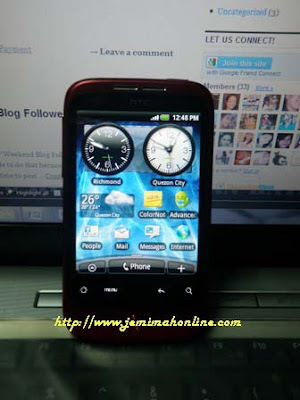 Last January, I posted here about my durable Sony Ericsson Cellphone and last year I also shared that I am planning to buy a new Sony Ericsson Aspen Mobile Phone.Â Things have change so I choose to buy the HTC wildfire smartphone. 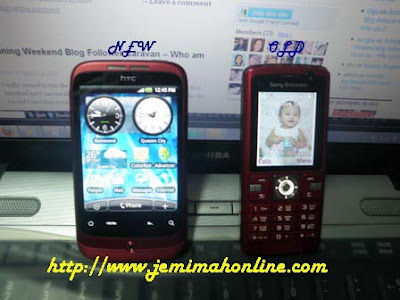 The color of my HTC wildfire smartphone is red same with the color of my old phone. In the photo below you will see my new HTC Wildfire Smartphone and the old Sony Ericsson K610i. The photo below is my New HTC Wildfire Smartphone. When we visited HTC branch in SM North Edsa Cyberzone at The Annex, there is a promo price for this phone which cost Php 12, 000 plus for cash price and it would cost almost Php 15, 000 if you are going to use a credit card to purchase the phone. I am still trying to explore the great features of the HTC Wildfire Smartphone and I will share the phone review possibly after a week of usage of this phone. This entry was posted in Mobile Phone and tagged htc smartphone, htc wildfire, red htc wildfire. Bookmark the permalink.